This is about being lost in the woods. And I was just remembering it was a children’s story my mom used to read to us when we were little, It was pretty gruesome; it was pretty mind-boggling. And there were pictures! And so, it was about two little children, a brother and a sister. For some reason, their stepmother did not want them, and they were a woodcutter’s children, so they lived out in the forest. The stepmother tried to get rid of them. They lived in the forest, right? So they had little pebbles. And the little girl, especially, knew, so she took these little pebbles and used them, one by one, dropping them to mark the trail. So, anyway, the little girl had it right. So she and her brother found their way back home after the wicked stepmother left, right? … by following these little pebbles. So then, the next time the stepmother knew to check their pockets for pebbles. But she gave them each a little crust of bread to take with them. And she led them back out into the forest. The little girl left little crumbs all along the path. But the birds came and ate them. And as I recall, the upshoot of the story was, that the two of them just hugged each other through the night, and then slowly, they both died. Right now, this time when everybody is ascending, and the path before us is not a path that we have taken before, I am reminded of that story in my childhood, and how frightened I was of the idea of being off on my own, in an unknown place, needing to take care of my little brother, and not knowing the way back. And the possible outcome, which was dramatic. I think there are a lot of people that are feeling like that right now. They are not sure what the path should be, or what the way should be. It seems unsafe, The way seems perilous, and the possibility of death seems really close. They are not sure how to prepare, because this is all new. This is the place where we’ve never been. Or, if we have been there, we don’t remember it. I was also reminded of a course I took at UCLA (University of California, Los Angeles) years ago, that had to do with survival. There were four or five of us in a work group. They set us all down at a table, and told us to pretend that our plane had gone down in the desert. The question posed to us was: What should we do to survive. When we got finished with the exercise, and had done all the things that we were asked to do, the teacher came round with the answers about what would have been the right thing to do to survive. As it turned out, the thing that was most important was something that was recommended by a person whose opinion I, as the leader, had disregarded. That taught me that everybody’s ideas, in a situation like that, are very important. It is very important to consider all the possibilities, and not to let the ego take charge. But rather, to bring everybody together into the situation, to help solve that problem. So for what it is worth, if you feel lost and alone, and you are not sure what to do right now, go and find some other people that are in the same boat, and feel the same way, and see if, together, a number of solutions can be thought of. If one doesn’t work, then maybe the next one will. Cooperation, unity, harmony, and so forth … those things will benefit us better than that ‘take charge’ attitude. The great turning to the Divine Light of love in all we meet will see humanity through the ascension process. My sense of this ‘turning to’ is more like a meeting of hearts … rather than a ‘clinging’ of minds, which is one of the things uniquely happening in this time of transition. This ‘clinging’ of minds is only a distorted precursor of the New Reality … in the same way that the mental mind is only a distortion of the heart’s reality. Not to say that there is no hope for the mind. As we all transform, our minds will also transform — into the new Cosmic Mind. A great day is coming for mankind! So … the letting go of mental mind clinging. The coming together of hearts in Divine love. The transformation of the mental mind to the Cosmic Mind. And the co-creation of New Earth. What an exciting time to be alive! “Hard by a great forest dwelt a poor wood-cutter with his wife and his two children. The boy was called Hansel and the girl Gretel. He had little to bite and to break, and once when great dearth fell on the land, he could no longer procure even daily bread. Now when he thought over this by night in his bed, and tossed about in his anxiety, he groaned and said to his wife: ‘What is to become of us? How are we to feed our poor children, when we no longer have anything even for ourselves?’ ‘I’ll tell you what, husband,’ answered the woman, ‘early tomorrow morning we will take the children out into the forest to where it is the thickest; there we will light a fire for them, and give each of them one more piece of bread, and then we will go to our work and leave them alone. They will not find the way home again, and we shall be rid of them.’ ‘No, wife,’ said the man, ‘I will not do that; how can I bear to leave my children alone in the forest?—the wild animals would soon come and tear them to pieces.’ ‘O, you fool!’ said she, ‘then we must all four die of hunger, you may as well plane the planks for our coffins,’ and she left him no peace until he consented. ‘But I feel very sorry for the poor children, all the same,’ said the man. “The two children had also not been able to sleep for hunger, and had heard what their stepmother had said to their father. Gretel wept bitter tears, and said to Hansel: ‘Now all is over with us.’ ‘Be quiet, Gretel,’ said Hansel, ‘do not distress yourself, I will soon find a way to help us.’ And when the old folks had fallen asleep, he got up, put on his little coat, opened the door below, and crept outside. The moon shone brightly, and the white pebbles which lay in front of the house glittered like real silver pennies. Hansel stooped and stuffed the little pocket of his coat with as many as he could get in. Then he went back and said to Gretel: ‘Be comforted, dear little sister, and sleep in peace, God will not forsake us,’ and he lay down again in his bed. When day dawned, but before the sun had risen, the woman came and awoke the two children, saying: ‘Get up, you sluggards! we are going into the forest to fetch wood.’ She gave each a little piece of bread, and said: ‘There is something for your dinner, but do not eat it up before then, for you will get nothing else.’ Gretel took the bread under her apron, as Hansel had the pebbles in his pocket. Then they all set out together on the way to the forest. When they had walked a short time, Hansel stood still and peeped back at the house, and did so again and again. His father said: ‘Hansel, what are you looking at there and staying behind for? Pay attention, and do not forget how to use your legs.’ ‘Ah, father,’ said Hansel, ‘I am looking at my little white cat, which is sitting up on the roof, and wants to say goodbye to me.’ The wife said: ‘Fool, that is not your little cat, that is the morning sun which is shining on the chimneys.’ Hansel, however, had not been looking back at the cat, but had been constantly throwing one of the white pebble-stones out of his pocket on the road. 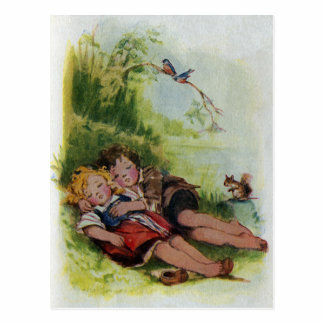 Image: Hansel and Gretel sleeping in the woods poster: http://rlv.zcache.com/hansel_and_gretel_sleeping_in_the_woods_postcard-raa51bd1e6fdf4e07957721c886074471_vgbaq_8byvr_324.jpg ..
“When at last they awoke, it was already dark night. Gretel began to cry and said: ‘How are we to get out of the forest now?’ But Hansel comforted her and said: ‘Just wait a little, until the moon has risen, and then we will soon find the way.’ And when the full moon had risen, Hansel took his little sister by the hand, and followed the pebbles which shone like newly-coined silver pieces, and showed them the way. “They walked the whole night long, and by break of day came once more to their father’s house. They knocked at the door, and when the woman opened it and saw that it was Hansel and Gretel, she said: ‘You naughty children, why have you slept so long in the forest?—we thought you were never coming back at all!’ The father, however, rejoiced, for it had cut him to the heart to leave them behind alone. “Not long afterwards, there was once more great dearth throughout the land, and the children heard their mother saying at night to their father: ‘Everything is eaten again, we have one half loaf left, and that is the end. The children must go, we will take them farther into the wood, so that they will not find their way out again; there is no other means of saving ourselves!’ The man’s heart was heavy, and he thought: ‘It would be better for you to share the last mouthful with your children.’ The woman, however, would listen to nothing that he had to say, but scolded and reproached him. He who says A must say B, likewise, and as he had yielded the first time, he had to do so a second time also. “Early in the morning came the woman, and took the children out of their beds. Their piece of bread was given to them, but it was still smaller than the time before. On the way into the forest Hansel crumbled his in his pocket, and often stood still and threw a morsel on the ground. ‘Hansel, why do you stop and look round?’ said the father, ‘go on.’ ‘I am looking back at my little pigeon which is sitting on the roof, and wants to say goodbye to me,’ answered Hansel. ‘Fool!’ said the woman, ‘that is not your little pigeon, that is the morning sun that is shining on the chimney.’ Hansel, however little by little, threw all the crumbs on the path. “The woman led the children still deeper into the forest, where they had never in their lives been before. Then a great fire was again made, and the mother said: ‘Just sit there, you children, and when you are tired you may sleep a little; we are going into the forest to cut wood, and in the evening when we are done, we will come and fetch you away.’ When it was noon, Gretel shared her piece of bread with Hansel, who had scattered his by the way. Then they fell asleep and evening passed, but no one came to the poor children. They did not awake until it was dark night, and Hansel comforted his little sister and said: ‘Just wait, Gretel, until the moon rises, and then we shall see the crumbs of bread which I have strewn about, they will show us our way home again.’ When the moon came they set out, but they found no crumbs, for the many thousands of birds which fly about in the woods and fields had picked them all up. Hansel said to Gretel: ‘We shall soon find the way,’ but they did not find it. They walked the whole night and all the next day too from morning till evening, but they did not get out of the forest, and were very hungry, for they had nothing to eat but two or three berries, which grew on the ground. And as they were so weary that their legs would carry them no longer, they lay down beneath a tree and fell asleep. “and went on eating without disturbing themselves. Hansel, who liked the taste of the roof, tore down a great piece of it, and Gretel pushed out the whole of one round window-pane, sat down, and enjoyed herself with it. Suddenly the door opened, and a woman as old as the hills, who supported herself on crutches, came creeping out. Hansel and Gretel were so terribly frightened that they let fall what they had in their hands. The old woman, however, nodded her head, and said: ‘Oh, you dear children, who has brought you here? do come in, and stay with me. No harm shall happen to you.’ She took them both by the hand, and led them into her little house. Then good food was set before them, milk and pancakes, with sugar, apples, and nuts. Afterwards two pretty little beds were covered with clean white linen, and Hansel and Gretel lay down in them, and thought they were in heaven. “The old woman had only pretended to be so kind; she was in reality a wicked witch, who lay in wait for children, and had only built the little house of bread in order to entice them there. When a child fell into her power, she killed it, cooked and ate it, and that was a feast day with her. Witches have red eyes, and cannot see far, but they have a keen scent like the beasts, and are aware when human beings draw near. When Hansel and Gretel came into her neighbourhood, she laughed with malice, and said mockingly: ‘I have them, they shall not escape me again!’ Early in the morning before the children were awake, she was already up, and when she saw both of them sleeping and looking so pretty, with their plump and rosy cheeks she muttered to herself: ‘That will be a dainty mouthful!’ Then she seized Hansel with her shrivelled hand, carried him into a little stable, and locked him in behind a grated door. Scream as he might, it would not help him. Then she went to Gretel, shook her till she awoke, and cried: ‘Get up, lazy thing, fetch some water, and cook something good for your brother, he is in the stable outside, and is to be made fat. When he is fat, I will eat him.’ Gretel began to weep bitterly, but it was all in vain, for she was forced to do what the wicked witch commanded. “Early in the morning, Gretel had to go out and hang up the cauldron with the water, and light the fire. ‘We will bake first,’ said the old woman, ‘I have already heated the oven, and kneaded the dough.’ She pushed poor Gretel out to the oven, from which flames of fire were already darting. ‘Creep in,’ said the witch, ‘and see if it is properly heated, so that we can put the bread in.’ And once Gretel was inside, she intended to shut the oven and let her bake in it, and then she would eat her, too. But Gretel saw what she had in mind, and said: ‘I do not know how I am to do it; how do I get in?’ ‘Silly goose,’ said the old woman. ‘The door is big enough; just look, I can get in myself!’ and she crept up and thrust her head into the oven. Then Gretel gave her a push that drove her far into it, and shut the iron door, and fastened the bolt. Oh! then she began to howl quite horribly, but Gretel ran away and the godless witch was miserably burnt to death. –from “Grimms’ Fairy Tales,” by Jacob Grimm and Wilhelm Grimm. (2008). Urbana, Illinois: Project Gutenberg. Retrieved 30 August 2013, from http://www.gutenberg.org/ebooks/2591 ..
Link: “Lost: A Native American Poem,” by Pathwriter, https://pathwriter.wordpress.com/2012/03/04/lost-native-american/ .. This entry was posted in 06 – Monasic body / Higher mind body (Cosmic mind), Co-creation of reality - New Creation, Earth - Gaia, Ego - higher self, Faith - despair - hope - trust, Grouping - leadership, Stories - myths - visions - legends, Transformation - personal alchemy and tagged Chaos theory - butterfly effect, co-creation, co-operation, community, cosmic mind, Death, Divine Love, ego, fairy tales, faith, Hansel and Gretel, leadership, lost, New Earth, stories, transformation on 30 August 2013 by Alice B. Clagett.